35% Off AphroChic’s Haze Silk Mimosa Pillow! 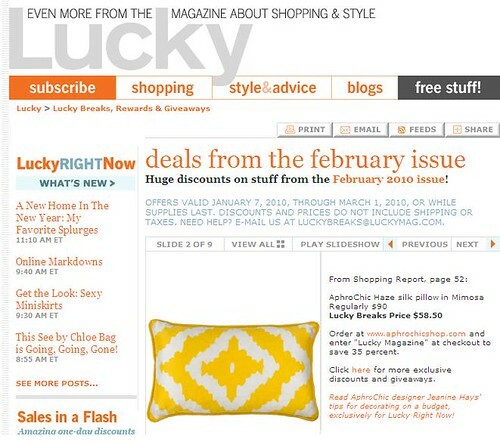 To help you remake your rooms for 2010, AphroChic teamed up with Lucky Magazine for a very special deal on the Haze Silk Mimosa pillow that’s featured in the February issue – 35% OFF just for you! In a vibrant electric yellow pattern, this pillow will brighten up your space, and with a 100% down feather insert it will also make your sofa extra comfy. It’s a new year, and a brand new decade, so now is a fantastic time to update your home decor. When I started working on the AphroChic pillow collection, I thought about how pillows can be used to reinvent an interior. In a recession, it’s difficult to think about buying a new sofa, bed, table, or anything that’s going to cost hundreds or even thousands of dollars. In my own home, when I can’t make a large purchase I use pillows to transform my decor. Pillows can be a subtle addition or a radical shift in the color scheme of a room. Other times, they just add an interesting print to an existing landscape. That’s why I love pillows so much: there’s nothing they can’t do! And best of all, every pillow in the AphroChic collection is designed to transform your interior without emptying your wallet. 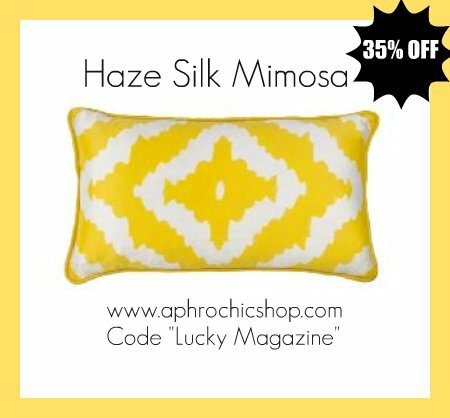 Head on over to the AphroChic Shop and enter code “Lucky Magazine” at checkout to get 35% off your Haze Silk Mimosa pillow. I promise you’re going to love it! https://www.aphrochic.com/wp-content/uploads/2017/02/Aphrochic-logo-glow-700.png 0 0 Jeanine Hays https://www.aphrochic.com/wp-content/uploads/2017/02/Aphrochic-logo-glow-700.png Jeanine Hays2010-01-11 18:56:002010-01-11 18:56:0035% Off AphroChic's Haze Silk Mimosa Pillow!